Pleasant Valley Road, 5 miles southwest of the Village of Black Earth. Prairie burns: how complete should they be? Burning a Wisconsin prairie in the winter! What happened to our fall burn weather? Yesterday, Kathie and I visited Nachusa Grasslands, a major prairie restoration site of the Nature Conservancy (TNC) in northern Illinois. This was an open house for resource managers in Wisconsin and Illinois. This was a fine event, with lots of time to visit Nachusa projects and talk to staff and attendees. At Nachusa Grasslands, TNC is recreating the Midwest's largest remaining prairie landscape. Nachusa (pronounced Nah-choo-sa) provides what must be the best example anywhere of a volunteer-driven conservation initiative. This project began in 1986 when TNC purchased about 300 acres of land just east of the Rock River in north-central Illinois. The original motivation was to save a number of scattered prairie remnants that had remained untrammeled by the mega Illinois agriculture machine. These remnants were primarily on rocky outcrops that had been unsuitable for row crops and had fortuitously escaped extensive grazing. The photo here shows one of these rocky remnants currently lush with rough blazing star (Liatris aspera), little bluestem, and many other dry-site prairie plants. 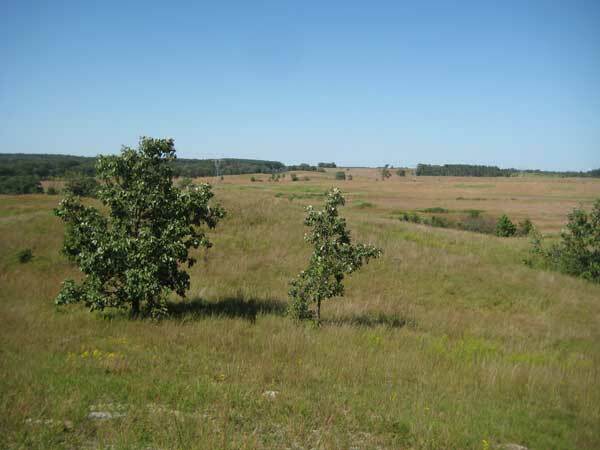 Along with the remnants came some ag land that had been in corn and soy beans, and this was where the first prairie plantings at Nachusa were carried out, using seeds collected from the remnants. From this modest beginning Nachusa has turned into a wonderful 3000 acre prairie landscape. 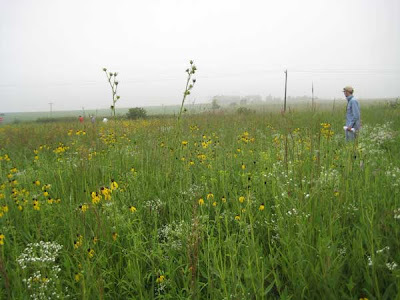 Although there is a two-person permanent staff and interns and other temporary paid help, almost all of the prairie plantings have been done by volunteer stewards. Individuals or couples are "given" sites to turn into prairies. They collect, clean, and plant the seed, and then continue to monitor and maintain "their" prairies. Using this model, Nachusa has built a great sense of community. Their annual newsletter, Prairie Smoke, gives some good insights into how Nachusa Grassland works. Much of the credit for the success of this project must certainly be given to the Nachusa manager, Bill Kleiman. The photo below gives a good view of what Nachusa looks like. Here, we are standing on a nice prairie remnant (with cream baptisia, prairie bush clover, and many other rarities), looking out across a restored landscape. Prairie as far as the eye can see. The motivation of the volunteers is impressive. Although Nachusa is in a very unpopulated part of Illinois, 95 miles west the Chicago Loop, volunteers are willing to drive as much as two hours to become involved in this important work. (Overnight weekend housing is provided for volunteers.) As one volunteer said: "We don't play golf. 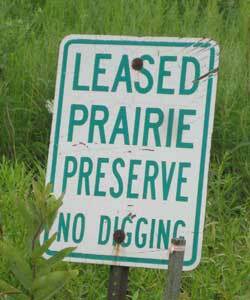 We play in the prairie." As befitting a TNC project, the site is well equipped, with a large historic barn as a center and an impressive array of motorized equipment. The seed processing facilities are excellent. 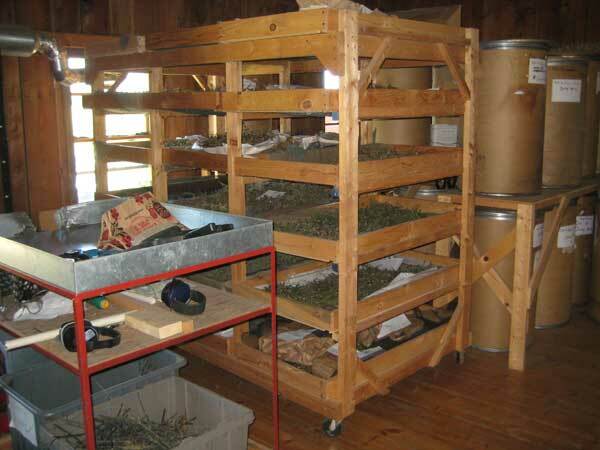 Each volunteer has his or her own seed drying racks and drum storage containers. Each volunteer dries and cleans his or her own seeds. One of the interesting things here is that Nachusa is not compulsive about cleaning seed. 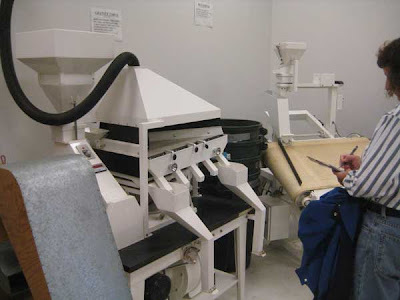 Most seed is run through a hammer mill but no other cleaning steps are used. Seeds, chaff, and all are planted. One reason mentioned was that this way insect eggs, fungus spores, or other small biota associated with the seed that may play a role in plant establishment are not removed. Another reason is that this saves a lot of time. Planting is done at very high seeding rates (50 pounds per acre were mentioned). Also, very high species counts are used, with as many as 150 different species per planting. The goal is to achieve the highest diversity possible in the shortest length of time. The excellent results seem to indicate that this approach really works! In all, it was a great visit. We got lots of ideas, and we met lots of nice people. Thank you, Nachusa! Driving in rural Dane County west of Verona, Kathie and I were stunned to see several old fields that were being taken over by sumac. The photo here shows a "classic" growth pattern of a clone that has been allowed to spread unchecked. The field is obviously mowed, but one imagines that as the clone spreads further, the mower keeps giving it more room. There is another sumac clone just out of the photo to the right, which is being blocked from coalescing with this one by a clone of Canada goldenrod in the middle. 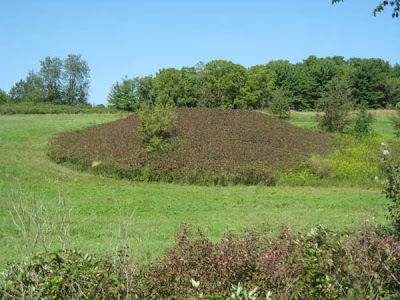 In the foreground is a substantial roadside population of sumac, and in the background left is another large sumac clone spreading down the hill. Nearby was another old field that is now solid sumac. This area along Messerschmidt Road would make a great research site for someone interested in clonal growth of invasive species. As those following these posts know, we have been battling buckthorn (Rhamnus cathartica) for many years. In the early years, we eradicated lots of large buckthorn shrubs (really small trees) using basal bark herbicide (Garlon 4 in oil). 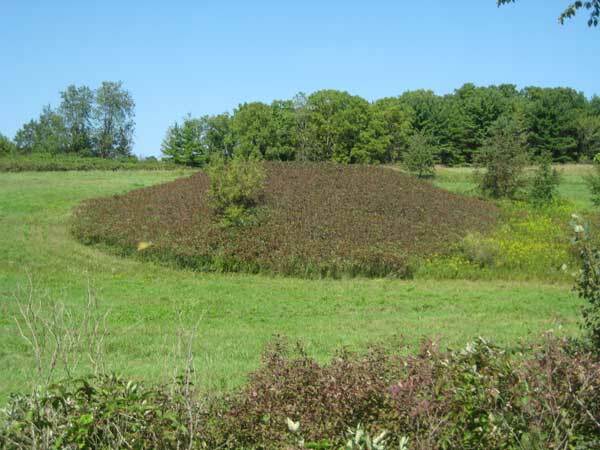 However, getting rid of the large buckthorns did not "eradicate" this pesky species. New growth, presumably from the seed bank, kept coming up. For many years, we assumed that all the new growth we were seeing arose from this seed bank. However, as the years went by, we began to doubt this idea, especially since the available research suggested that buckthorn seeds don't survive long in soil. In several areas of Pleasant Valley Conservancy, we have been working to eradicate buckthorn for at least ten years, and although buckthorn is a lot less than it once was, it has still not been eradicated. In one experimental area, we have been working consistently for three years. This is an area just north of the Rocky Overlook, where small buckthorn shoots are quite common. This is an interesting area, because when we started there it had a small remnant population of lead plant. As we knocked back the buckthorn, the lead plant has expanded, and is now one of the major species. But each year we still have numerous small buckthorn plants. These are almost all multi-stemmed plants, with each stem arising from a small area at the base. Why multi-stemmed, and why do they keep on coming? 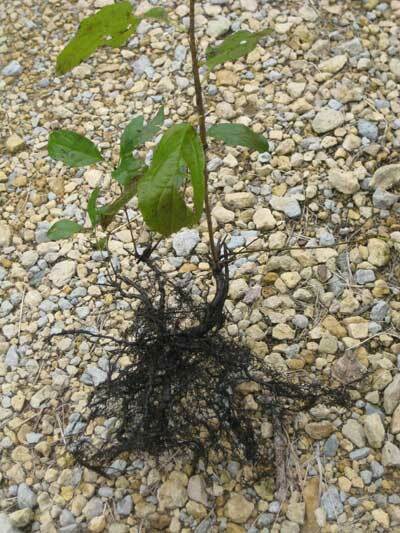 Today I dug up the small buckthorn plant with two stems, shown in the photo here. The typical fibrous root system is visible, but above this is a very thickened underground stem from which the two shoots arise. When Kathie looked at this root mass, she pointed out that there were at least three or four small dead shoots which had probably been killed by fire some earlier year. But the green shoots must have come from living buds that were below the surface and hence protected from fire. Although invisible in the spring, these shoots grew up during the summer and if not killed have the potential to make a fairly substantial plant. If I kill these shoots, will I kill the whole root mass? Possibly not. There may be more dormant buds. It seems evident that rather than dealing with a persistent seed bank, we are dealing with persistent living root masses, left over from the original buckthorn infestation that we removed years ago. This situation is not unique to Pleasant Valley Conservancy. I have seen numerous sites in Dane County where buckthorn has been cut and treated with herbicide, but new shoots have arisen a year or two afterward. These shoots are not arising from a seed bank, since they are much too vigorous to have arisen from tiny seedlings. They most likely are coming from an underground viable root mass. The moral here is that if we are to eradicate buckthorn from a site, we must return year after year, killing all new shoots with herbicide, until we finally exhaust the capabilities of these underground root masses. I think we are up to the task. This year we have been using a more efficient and more benign herbicide treatment, spritzing a couple of leaves on each buckthorn shoot with Garlon 4 in oil, as described in an earlier post. I have been quite happy with this approach, especially since with reasonable care the now extensive lead population is not affected. In order to find out how many more years I have to continue spraying buckthorn, I have staked out an area and am systematically traversing it, making sure that I spray every plant. Since not all buckthorn shoots are large enough to see at the same time, I have been returning every week or two and spraying every newly visible shoot. Fortunately, the buckthorn shoots are fairly easy to recognize, because of their shape, their dark green color, and their shiny appearance. Most of the shoots are knee high or less, although a few quite small ones may be hidden beneath the larger ones. If these are missed in the next few weeks, they should definitely be visible in early October, when all of the native vegetation is senescing. At that time, they can be basal barked with Garlon 4, which should kill them permanently. 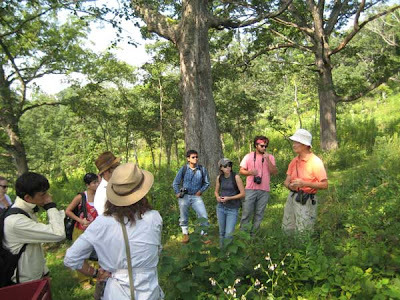 The focus of the morning tour was the oak savanna landscape at Pleasant Valley Conservancy. We discussed the presettlement vegetation, early agricultural practices, changes after agriculture ceased, and the extensive work we have carried out to restore the site to its original character. Considerable discussion focused on the important role fire has in maintaining the oak openings character of the site. Kathie and I explained briefly the way prescribed fire is carried out in a savanna landscape. During the tour, the students had an opportunity of making quick surveys of the understory vegetation. Not surprisingly, these students were quite skilled at quickly capturing with pencil and paper the trees and flowers of the Conservancy. Taliesin maintains two campuses, the one at Spring Green, and Taliesin West, which is in Scottsdale (suburban Phoenix) Arizona. The students spend most of their time at Taliesin West but transfer to Spring Green for the summer. Details of the educational program can be obtained from the Taliesin web site, at this link. It is estimated that 70% of the plant flora of temperate regions exhibit clonal growth, including many invasive species (both native and nonnative). An understanding of clonal growth patterns is important in developing strategies for control of invasive species. Two major types of clonal growth patterns have been recognized, which have been called guerrilla and phalanx (Lovett Doust, 1981, Journal of Ecology Vol. 69: 743-755). Both of these terms come from warfare, and reflect the idea that the spread of a clonal plant across a site has an element of "force" about it. In warfare, a phalanx represents a massed army formed in closed, deep ranks. 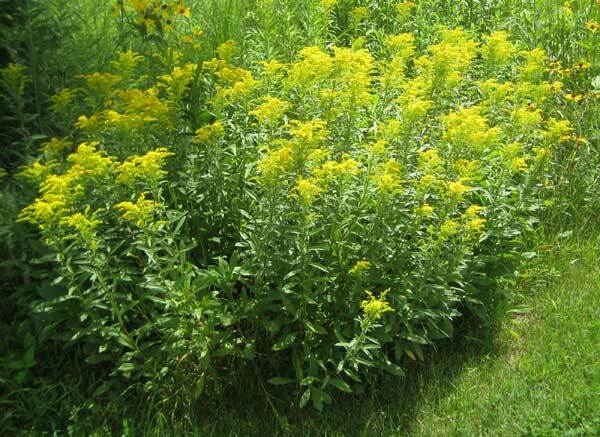 A botanical example is Missouri goldenrod (photo below), whose advancing front is very compact, with many short, highly branched rhizomes. Woodland sunflower is another example. A guerrilla, on the other hand, is a person engaged in independent warfare, becoming established in an outlying part of an area. An example of guerrilla growth is aspen. Aspen plants send out lengthy unbranched rhizomes which send up new shoots far away from the main front. Other examples of guerrilla plants are black locust and wild sarsaparilla. Guerrilla's wander through space and one clone may intermingle with others, whereas phalanx clones tend to form distinct clumps or patches. The phalanx clone is thus easier to recognize than the guerrilla one. If undesirable, the phalanx clone, being very obvious, is generally an early candidate for eradication, although because of the density of the shoots, eradication may be difficult to achieve. However, such clones are good candidates for herbicide treatment. Eradication of guerrilla clones requires different tactics, as well as much more extensive surveys of the site to find the centers of colonization. The rate of clonal growth is a function of the conditions of the soil into which the rhizomes are extending. Very compact soils resist rhizome growth, slowing down the spread of the clone. Also, soil moisture, nutrients, and presence of other plants, can markedly affect clonal growth. There is a vast amount of research on the physiology of clonal growth, but since most of the information is species specific, it is difficult to apply to other species. Although we are still pulling a few sweet clover plants, it is time to start thinking about seed collecting. Of course, we have been collecting seeds of "early" species since the 4th of July or earlier, but the major seed collecting push is still down the road. The season seems to be advanced almost two weeks from previous years (global warming? ), so the seed collecting dates given in on our web site must be questioned. I'd start thinking about checking species shown in early September now (if not last week!). We have already collected Zizia aurea, and have started on Elymus hystrix, Bromus kalmii, and the other savanna grasses. All the early September species such as Illinois trefoil, side oats grama, prairie cinquefoil, white baptisia, etc., should be checked now, and collected if ready. We don't have any major plantings scheduled for this year, but we do have need for a lot of seed to plant in all the woodland sunflower and sumac areas that we eradicated this summer. These are mostly savanna areas where a good open-savanna mix would be best. Since these areas have been marked with semi-permanent stakes, we'll be able to find them at planting time in November. Watch out for the clones! 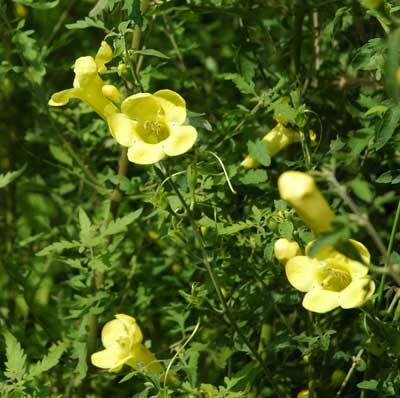 We have been inclined to think that the invasive plants we have to deal with in restoration ecology are nonnative, but it turns out that most of the clonal species we contend with are native. How do you recognize a clonal species? One characteristic of a clonal species is its ability to send up new stems from underground rhizomes, a process called "root suckering". This property occurs during clonal growth, but it will also occur if the above-ground stems are eliminated by cutting and/or herbicide treatment. Research on aspen and black locust, which are notorious for root suckering, has shown that auxin, the plant hormone, plays an important role in root suckering. During normal growth, auxin produced by growing stems is translocated to the rhizomes, where it inhibits suckering. If auxin is eliminated by removal of the stems, the inhibition is abolished and growth of new shoots from rhizomes ensues. For instance: I got rid of a whole clone of sumac by cutting and treating the cut stems with herbicide. Within a month, new shoots had started to appear and they continued to appear the following year. Eventually, over 200 new stems had arisen from a clone of about 100 stems that I had cut. Obviously, if one is going to eradicate the clone, one has to kill all these new root suckers, which requires returning to that clone again and again, until its resources are exhausted. It may take several years, but eradication can be accomplished. 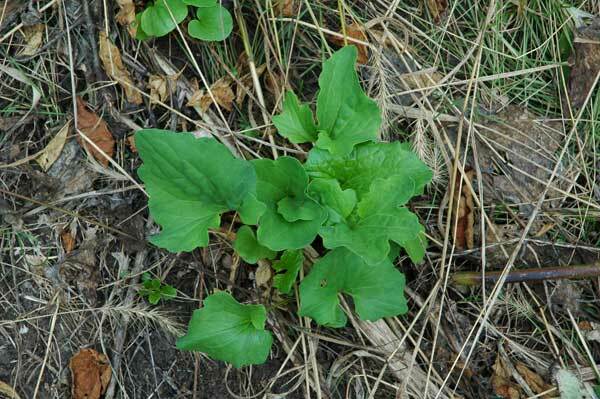 One of the herbaceous species on the list above is pale Indian plantain (Arnoglossum atriplicifolia). 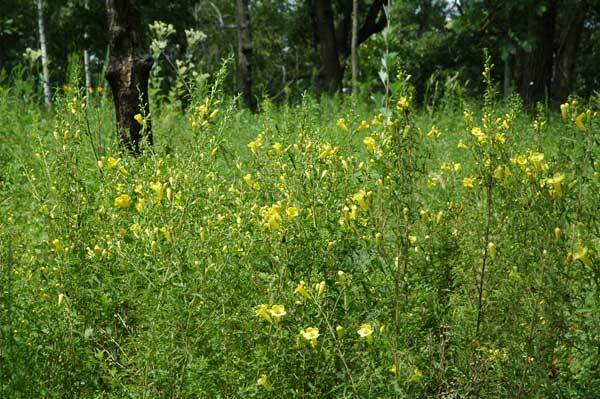 In an earlier post, I described some draconian methods we had used to eradicate a large patch of this plant. In that post, I expressed puzzlement as to why this native species was giving us difficulties. At that time, I had not known that this was actually a clonal species with an impressive rhizome system. Recently, I discovered a research paper that showed very clearly that pale Indian plantain is clonal, and capable of spreading extensively. (Athey and Pippen, 1987. Michigan Botanist Volume 26, pp. 3-15.) Now that I know this is a clonal species, I am looking at our large patches in a different way. I'll have more to say about the pale Indian plantain problem in a later post. As part of last week's North American Prairie Conference, I had a chance to visit the facilities of the Tallgrass Prairie Center at the University of Northern Iowa. This Center is an outstanding example of what can be done to promote and create prairies in a university evironment. The Director, Daryl Smith, has a long background in prairie restoration and reconstruction. He currently teaches courses in Restoration Ecology, Fire Ecology, and Prairie Ecology (the latter in the summer at the Iowa Lakeside Laboratory). The Tallgrass Center was established at UNI in 1999 as the Native Roadside Vegetation Center and acquired its present name in 2006. It is located on the West Campus of the University, where it has extensive physical facilities. It also has 65 acres of campus and leased land for research and native seed production plots. The Center also carries out prescribed burns and other management work on native prairie remnants in the Northern Iowa area. It has four full-time staff: Daryl Smith, Dave Williams, Greg Houseal, and Kirk Henderson. The Tallgrass Prairie Center also offers graduate training in prairies and prairie restoration, and currently has seven students working on Master's degrees. Most of its funding is from Federal and State grants. Recently, a flurry of videos and publications on prairies have appeared from the Tallgrass Center, providing physical evidence of the great work of this program. In addition, the Tallgrass Center manages the Iowa Ecotype Project, whose mission is to produce regionally adapted Iowa Source Identified Foundation seed for commercial producers. The Foundation seed has been derived from Iowa native prairie remnants. 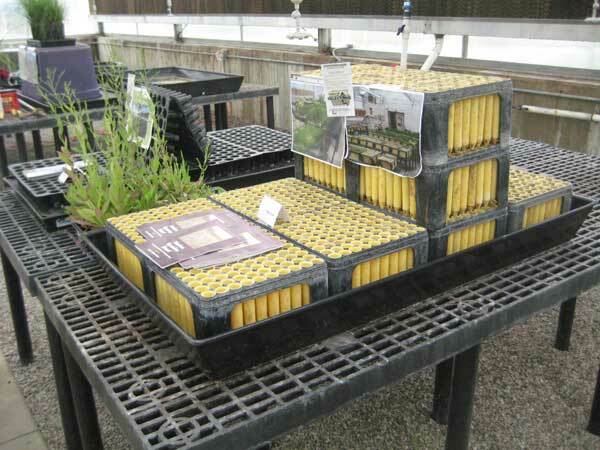 The Tallgrass Center has a nicely equipped greenhouse where it raises seedlings for transplant into its production beds. Through their research, they have developed practical and highly efficient ways for raising seedlings (plugs). As shown in the photo below, most of the seeds are raised in "cone-tainers" that were originally developed for raising trees, but also work well for deeply rooted prairie plants. In addition to its large utility building and greenhouse, the Tallgrass Center has a substantial office building with a laboratory and small conference facility. In all, a very impressive set-up. Prairie restoration is in good hands in Iowa! 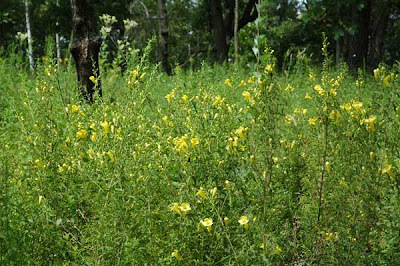 Large-flowered false foxglove (Aureolaria grandiflora) is a savanna specialist with an interesting life history. This year it is doing particularly well at Pleasant Valley Conservancy, probably because of the very good moisture levels. This species is called a hemiparasite, which means that it grows only in association with another species, not killing it, but getting important nutrients from it. In contrast to a true parasite, it has chlorophyll and carries out photosynthesis. However, its roots must set up an infection with another plant in order to survive. In the case of A. grandiflora, the required host is an oak, specifically a member of the white oak group (bur, white, swamp white). If you plant seeds of this species in potting soil and try to cultivate the plant in a greenhouse, the seeds germinate and make tiny plants, but unless they set up an association with an oak, they do not develop. Eventually they die. Note that this is an "obligate" parasitism. There is no evidence that the foxglove benefits the oak. When we started oak savanna restoration at Pleasant Valley Conservancy, this species was not present, but Rich Henderson kindly gave us some seed. "Plant them under the drip line of the oaks," Rich told us, and this is what we did. We walked around the savanna with the bag of seed, looking up at the canopy for a large oak. Then we walked around the periphery of the tree, throwing out seeds. Within a couple of years, we had our first plants, and they have spread greatly on their own. Whenever I see a population of this foxglove, I always look to see if there is an oak nearby. Sometimes the only tree nearby is a small oak grub, but the population in the photos here was growing with a nice large white oak. As the photo at the top shows, this population is very healthy. The flowers are quite substantial and this species would make an excellent garden plant, provided you had an oak nearby. This genus is in the Snapdragon family (Scrophulariaceae), and it turns out that quite a few members of this family are hemiparasites. For instance, wood betony and lousewort (Pedicularis canadensis and P. lanceolata) are also snapdragons and are well known hemiparasites. Indian paintbrush is another. I did a literature search and could find no research dealing with the details of Aureolaria hemiparasitism, although there has been work with paintbrush. This week I attended the 22nd North American Prairie Conference at the University of Northern Iowa, Cedar Falls. 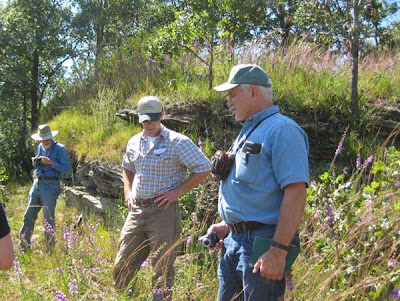 These prairie conferences have been held every two years since 1968, and this one was hosted by the Tallgrass Prairie Center at UNI. Over 500 people attended, mostly from the Midwest. In addition to three days of papers and posters, one day was reserved for field trips. Over a dozen field trips were run. On the one I attended we visited several small high-quality prairie remnants. Plentiful rainfall had also occurred in Iowa, so the prairies were lush and colorful. The second prairie we visited was a "railroad" prairie, existing along the right-of-way of the Burlington Northern Railroad. Railroad prairies were very common in the prairie areas in the 19th century, because the land adjacent to the railroad was not plowed. Also, the steam engines, mostly wood burners, spewed out sparks and burning ashes which set the prairies on fire. In the 19th century, virtually every railroad right-of-way burned almost every year. The prairie we visited has an interesting history, since a resident of the nearby town who cherishes this site leases the prairie strip from the railroad for $100 a year, and the Tallgrass Prairie Center conducts frequent burns. Because of the topography, there is a gradient at this site from fairly wet at one end (lots of Liatris pychnostachya) to dry at the other end (lots of Eryngium yuccifolium and Liatris aspera). Fortunately, the railroad only sprays a narrow zone near the tracks, so that none of this prairie is herbicided. One of the pleasures of these prairie tours is that the participants have a wide variety of expertizes. On our trip there were quite a few Iowa residents who knew the local flora well, and there were those from more distant areas who could add their own perspectives. 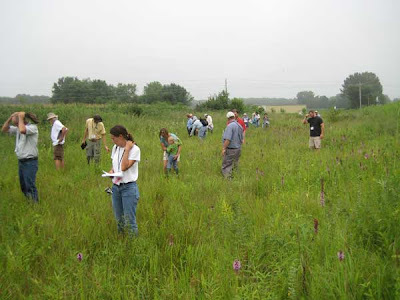 The brief discussions in the field often provided great insights into prairie ecology. The conference itself was extremely well organized by the staff of the Tallgrass Prairie Center. 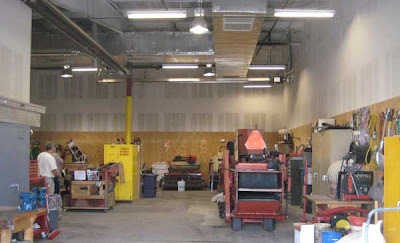 I had a chance to visit the Center's facilities and will report on them on another post.